The Wiggles new DVD NURSERY RYHMES was released on DVD during October and includes a special bonus feature Cinder Emma: A Musical Fairy Tale. Emma, Lachy, Simon and Anthony have selected, arranged and performed this collection of nursery rhymes for you. Families all around the world have sung nursery rhymes to each other for many generations! Nearly everybody has a favourite nursery rhyme from when they were children. Simon tells us his favourite was, and still is, “The Old Woman Who Lived in a Shoe”, Emma can’t go past “Three Little Kittens”, Lachy loves “Wheels on the Bus”, whilst Anthony’s favourite is “Old MacDonald Had a Farm”. DVD and CD also includes counting and colours in multiple languages. 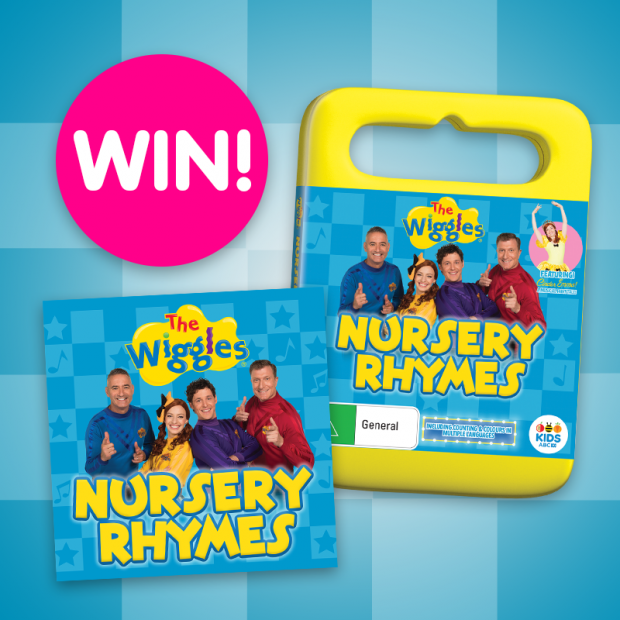 I have two Wiggles Nursery Rhymes Prize Packs to give away – each prize pack contains a DVD & CD! To enter tell me in 25 words or less which is your favourite nursery rhyme and why? Competition ends 30 November 2017. Full T&C’s can be found here. Incy Wincy Spider because it always ends in lots of tickles. Twinkle Twinkle Little Star. It’s beautiful, easy to remember the words and kids love to do the actions. Hot cross buns because I love Hot cross buns! The Wiggles Rock-A-Bye Your Bear. My boys love making the shhh noise then happily close their eyes for bed time. Row, row, row your boat, my son just giggles and giggles, he loves it and the actions. Old MacDonald Had A Farm with lots of Oinks, Moo’s, Baa’s. The kids throw curly made up animals in and we invent new animal sounds. ‘Teddy bear, teddy bear’. Fun memories skipping rope to the rhyme and mimicking his actions. Hilarious too when we made teddy grow a tail. Humpty Dumpty! He teaches us that if we have a fall we can be strong again. Wheels on the bus. I always loved doing the actions while singing the rhyme. I also used to create more lines to extend the song. Jack and Jill as these days they wouldn’t be allowed up the hill by themselves and if so they would wear helmets.